One of my truly lovely friends bequeathed to me the slate Opening Ceremony shoes pictured here. They easily have become my new love. 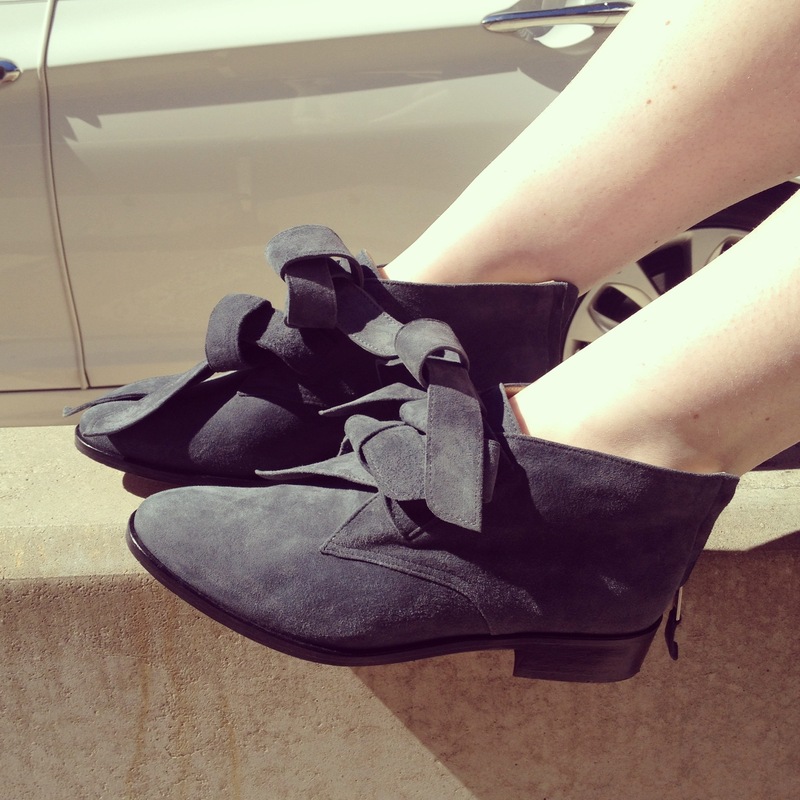 Seriously, it’s hard not to love something so unique and special such as a suede, knotted, slate colored bootie. My heart is a’flutter. Toss on my Sleeping on Snow sweater that I got on consignment for $16 and I am in slate heaven. This outfit felt very back to school to me. While I’m no longer in school, I cannot resist this updated slate school days look. The detailing on the shoes and sweater show just how passionate designers can be in regards to details and elegance. Can you tell I’m swooning? *sigh. 1) I’m really loving the fall transition look of skirts and dresses with no tights/leggings, but still closed toed booties. 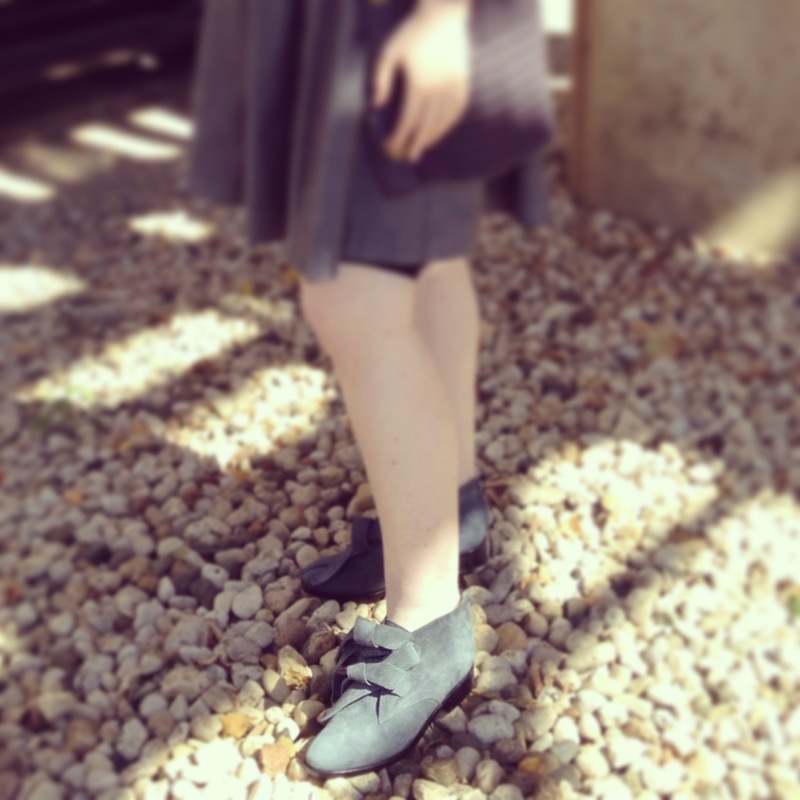 I used to shy away from closed toed booties without tights/leggings because I thought it looked odd. I was so wrong! It’s actually a great way to transition clothes. I plan to winterize this look by adding the tights when it gets a little cooler out. To break up the gray and slate, I’m thinking of wearing pale blue or pale pink tights that match the plaid button down pictured here. I know I’ve said it before, but some things really need to be tried on to see how it will end up looking once your whole ensemble is complete. I like to surprise even myself by ditching tights, for example, and doing something a bit differently than I have in the past. Anyone else have a favorite store they go to? I’m sure other readers would love suggestions! Well, lovely readers, I’m going to swoon more over slate; thank you for stopping by! I love you in navy blue and those shoes are fabulous! I always love transitioning into fall too. I really love that sweater!! The whole look is fabulous but I need that sweater!! I am in love with those shoes as well! i love that cardigan! it looks so comfortable. Love the outfit, great colour as well. 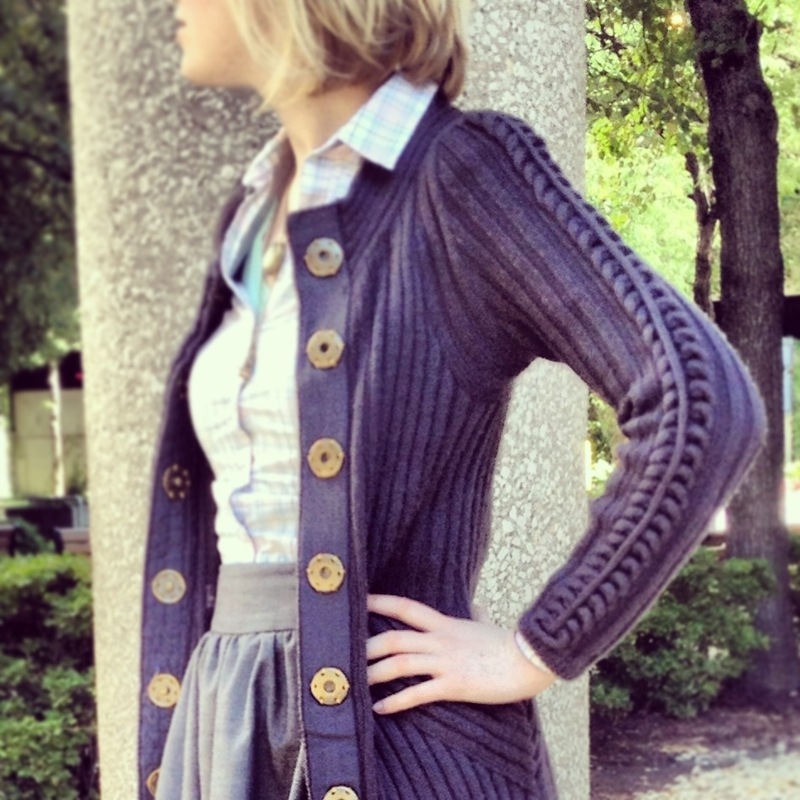 lovely outfit, the cardigan is absolutely chic! gorgeous shoes indeed, as is the rest of the outfit!! we love your hairstyle by the way, very chic cut! I was just thinking back to school before I read that, hehe. I really love the waistband of that skirt with the tailored top tucked in. And I’m with ya, I’ve recently become a closed-toe bootie convert! I think it just took a little getting used to initially, but now I love the look. A #lovelyprepster look. The colors are wonderful together, great eye!! Thank you!! So glad you stumbled upon the blog- just checked out yours and I love it!! I love gray for fall :). Seriously amazingly unique booties…you weren’t joking! Those shoes, that sweater ugh in lust with your look! Thanks everyone for supporting my back to school look 🙂 ! !